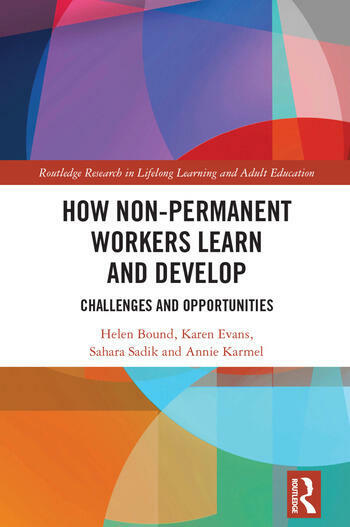 How Non-Permanent Workers Learn and Develop is an empirically based exploration of the challenges and opportunities non-permanent workers face in accessing quality work, learning, developing occupational identities and striving for sustainable working lives. Based on a study of 100 non-permanent workers in Singapore, it offers a model to guide thinking about workers’ learning and development in terms of an ‘integrated practice’ of craft, entrepreneurial and personal learning-to-learn skills. The book considers how strategies for continuing education and training can better fit with the realities of non-permanent work. Through its use of case studies, the book exams the significance of non-permanent work and its rise as a global phenomenon. It considers the reality of being a non-permanent worker and reactions to learning opportunities for these individuals. The book draws these aspects together to present a conceptual frame of ‘integrated practices’, challenging educational institutions and training providers to design and deliver learning and the enacted curriculum not as separate pieces of a puzzle, but as an integrated whole. With conclusions that have wider salience for public policy responses to the rise of non-permanent work, this book will be of great interest to academics and researchers in the fields of adult education, educational policy and lifelong learning. Helen Bound is Principal Research Fellow and Head of the Centre for Work and Learning at the Institute for Adult Learning, Singapore; Honorary Lecturer at the School of Education, University of Tasmania; and Honorary Principal Research Fellow with Griffith University. Karen Evans is Emeritus Professor of Education at University College London, and Honorary Professor with the Centre for Learning and Life Chances, University College London. Sahara Sadik is Principal Researcher at the Institute for Adult Learning, Singapore. Annie Karmel was Researcher at the Institute for Adult Learning, Singapore.